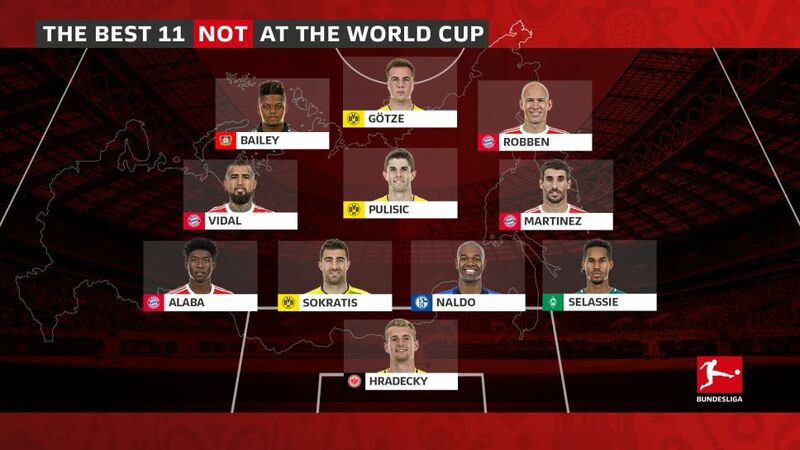 Marco Reus, Thomas Müller, Manuel Neuer and Co are rightly touted as favourites to lift the 2018 FIFA World Cup with Germany in Russia, but how would they fare against this hypothetical XI of Bundesliga stars who didn't make it to the tournament? The former Eintracht Frankfurt stopper played every minute of Finland's qualifying campaign, and only conceded 13 goals in a tricky Group I that also included Iceland, Croatia and Turkey. Ultimately, though, their inability to hold on to a lead - coupled with the fact the Huuhkajat only scored nine times - cost them dear and deprived Hradecky of a World Cup debut. Even the very best goalkeepers can make mistakes – just ask Sven Ulreich, Loris Karius and David de Gea, to name but a few – but Hradecky has ice-cool Scandinavian blood coursing through his veins and seems impervious to pressure. The 28-year-old did not miss a minute of Bundesliga action in 2017/18 and was a key member of Niko Kovac's Frankfurt side that lifted the DFB Cup title. That kind of composure at the back would be crucial to spreading confidence throughout this World Cup team. WATCH: 60 seconds under pressure with Hradecky! Czech Republic were somewhat unfortunate to be drawn alongside Germany in qualifying Group C, effectively making that section a race for second place. The Czechs were in contention right until the end, but a costly 2-0 defeat away to fellow hopefuls Northern Ireland three games before the end gave them too big a mountain to climb, and they ended up in third. Yes, admittedly Selassie's name may lack the allure of some of the more world-renowned figures in this particular fantasy team, but make no mistake: he is a baller. A marauding right-back, Selassie is a dynamic presence up and down the wing. Not only did he contribute three goals to Werder Bremen's Bundesliga campaign in 2017/18, he played more minutes than any other outfield player at the club and helped them achieve the fourth best defensive record (40 goals conceded) in the league – a better return than Borussia Dortmund, RB Leipzig, Hoffenheim, Leverkusen and Frankfurt, among others. Sokratis was at the heart of a Greece side that only suffered one defeat (against runaway Group H winners Belgium) in Russia 2018 qualifying, helping them concede just six times in 10 assignments. After finishing as runners-up in the standings they went through to the play-offs and although Sokratis scored in the first leg against Croatia, a heavy 4-1 defeat proved impossible to come back from in the return fixture. Do we really need to explain? Hewn in the image of an ancient Greek sculpture, the chiselled centre-back has been a muscular figure in the Dortmund side for several years and played more Bundesliga minutes last term than any other BVB player apart from goalkeeper Roman Bürki. The 30-year-old rarely gives the ball away and won an eye-watering 67 per cent of all his challenges in 2017/18 – attributes any team could do with at the global showpiece. This is a very good question. Naldo could scarcely have played any better in 2017/18 for Schalke, so much so that Brazil head coach Tite admitted he was considering giving the 35-year-old a recall to the national team for the first time since 2009. However, ultimately there was no room in the final 23-man squad for the centre-back, with Thiago Silva, Marquinhos, Miranda and Pedro Geromel all preferred in his stead. The disappointment of Austria's showing at UEFA EURO 2016 – where they finished bottom of Group F – seeped into their Russia 2018 qualifying campaign. Despite a side filled with experienced internationals, such as fellow Bundesliga stars Marcel Sabitzer, Martin Harnik and Alessandro Schöpf, Austria failed to get going and ended up fourth in Group D, behind Serbia, Republic of Ireland and Wales. The World Cup provides the stage for the very best players on the planet to strut their stuff, and there is no doubt Alaba belongs in that category. At 25 he is approaching his peak, while his positioning and awareness mean he is as solid as they come in defence. Blessed with pace, pinpoint crosses and a lethal eye for a free-kick, Alaba's two goals and three assists for Bayern in 2017/18 make him an asset at the other end of the pitch too. Like Naldo, Martinez's absence from Russia is a strange one – and not even the midfielder himself knows why he was left out of the Spain squad: [Julen Lopetegui] never called me or said anything about it," Martinez told ESPN. In the end it was not a huge surprise though, as the 29-year-old's last call up to La Roja was for friendly against France in March 2017. Restoring Martinez to defensive midfield from centre-back was Jupp Heynckes' first piece of business when he took over as Bayern coach last October. And if a man of Heynckes' experience and success wants Martinez in his team, anyone should. A towering, authoritative figure, the Spaniard reads the game superbly and is seemingly always in the right place to break up opposition attacks. As two-time Copa America champions, Chile were widely regarded as dark horses for the World Cup title not so long ago, but a series of below-par performances in South American qualifying left them stunned, ending up in sixth place in the round-robin 10-team table. They almost squeezed into fifth – and the accompanying intercontinental play-off spot – but a 3-0 defeat to Brazil in their last fixture left them with an inferior goal difference to Peru. World Cups are not won by talent alone, but by experience and an unbending will to win. In this regard, there is nobody better in the game. Vidal's aggression and innate determination to succeed make him the driving force of any side, while his tireless running and full-blooded tackling make for an intimidating presence in midfield. That the USA didn't manage to get their hands on a ticket to Russia 2018 is no fault of Pulisic's. The 19-year-old almost single-handedly dragged the Stars and Stripes to the verge of qualification, scoring seven goals and providing six assists along the way. However, even that was not enough to spare the blushes of an underperforming US team that finished fifth in the final six-team hexagonal stage of CONCACAF zone qualifying. Pulisic plays in a more central role for his national team and it would be an intriguing yardstick in his development to see him perform against the best defenders in the world. Given his fearlessness, maturity and pace – not to mention the frighteningly steep upward trajectory of his career so far – the chances are he would emerge with his reputation very much intact. Watch: Dortmund's wonderkid, Christian Pulisic! The Netherlands were drawn in an tricky qualifying group alongside France and Sweden, but having reached the semi-finals at the 2014 World Cup, the Oranje were fully expected to negotiate their way to this year's finals. However, they suffered three defeats – including a humiliating 4-0 loss to eventual Group A winners France – and even though Robben scored a brace to beat Sweden 2-0 in the team's last qualifier, the Scandinavians' far superior goal difference earned them the play-off spot. Robben subsequently announced his retirement from international football. Game-changing attacking players are a highly sought-after commodity nowadays – just look at the huge fees being forked out in recent transfer windows – and there are few as good or effective as Robben. He may be 34 but he still strikes fear into the hearts of full-backs wherever he goes, with his pace, direct running and terrifying left boot as dangerous as ever. Watch: Arjen Robben's Top 5 goals! Born and raised in Jamaica, Bailey only ever made one appearance in his country's colours, a friendly for the U-23s against the Cayman Islands in March 2015. Since then he has refused to feature for the Reggae Boyz, however, telling Kicker: "I've had personal problems with the FA since I was 11 or 12. I could've played for Jamaica a long time ago, but there are reasons why I don't." Jamaica were eliminated from CONCACAF qualifying for Russia 2018 in the fourth round anyway, and while it was reported that England were among a number of eligible nations interested in Bailey's services, ultimately nothing came of it. Bailey enjoyed a superb first full Bundesliga season in 2017/18, chipping in with nine goals and seven assists to help Leverkusen return to European competition next setermason. He did so with some seriously impressive displays, his pace on the counter-attack tearing defences apart, while he has a habit of scoring from distance with his powerful left foot. Who can afford to leave out the scorer of the winning goal at the last World Cup? Well, erm, Germany can. Such is the strength in depth available to Joachim Löw that only those who played consistently well throughout the season made the final cut. And as Götze struggled for form after illness and injury in 2017/18, he didn't make the grade this time. He's Mario Götze. And by that we mean: outstanding technique, elusive movement and the ability to thread a killer pass through the tightest of defences. Indeed, there are few players as naturally gifted as the Dortmund attacker anywhere. And, as the saying goes, there is no substitute for experience - and who better to deal with the pressure that comes with a World Cup than the man who came on as a substitute to fire Germany to glory four years ago? Click here to see the Bundesliga's World Cup dream team!